The Smothers Family: Tyler Smother, Cindy Smothers, Jay Smothers and Josh Smothers – visit The Arc's National Office. Tyler Smothers won The Arc's Achieve with us Contest, held last summer. Winning The Arc’s “Achieve with us” contest was such an exciting experience for me. As if winning wasn’t enough, part of the prize was a trip to Washington, DC to meet with members of the Iowa Congressional Delegation and The Arc’s national office. Tyler Smothers, and The Arc's CEO Peter Berns, at The Arc's national office during Tyler's visit to Washington, DC. Tyler Smothers is The Arc's Achieve with us Contest winner. Arriving in DC was a thrill, but even better was getting to The Arc’s office! I loved the banner that said “Welcome Tyler” when we got there. I was also given a bag with The Arc logo and other neat stuff, like The Arc vest that I was able to wear for part of my trip (The Arc’s CEO, Peter Berns was even wearing his vest when we met!). I thought meeting the Arc staff was great and everyone was very friendly, I really enjoyed meeting William Washington, The Arc’s receptionist! My first day was busy with meeting the national staff and then a trip to The Holocaust Museum. We walked to lots of memorials and I liked the pretty sites. I loved the hotel and it even had a gift shop! Tyler Smothers, The Arc's Achieve with us Contest winner, meets with Iowa Senator Tom Harkin with his mom, Cindy Smothers. The next day I visited Capitol Hill to meet with Senator Tom Harkin, Senator Chuck Grassley, and Congressman Dave Loebsack. I thought the Senators and Representative were friendly. I told them about my services and supports in Cedar Rapids and why they are important to me. I told them about winning the Arc’s “Achieve with us” contest and doing a fundraiser for the last 4 years now and raising over $40,000. My mom got to talk to them too about not cutting Medicaid and why that would be bad for so many people like me. Congressman Loebsack’s staff even gave me a personal tour of the U.S. Capitol. I loved the Capitol and getting the tour and seeing all the neat stuff there, like lots of big statues. On my last day in DC, my family and I were given a tour of the White House. It was a shame that President Obama was busy, but I enjoyed the tour of the White House and going on the elevator in the White House kitchen with the Secret Service and my dad. Thank you for all that The Arc does for me, my family, and people like me all over the country. 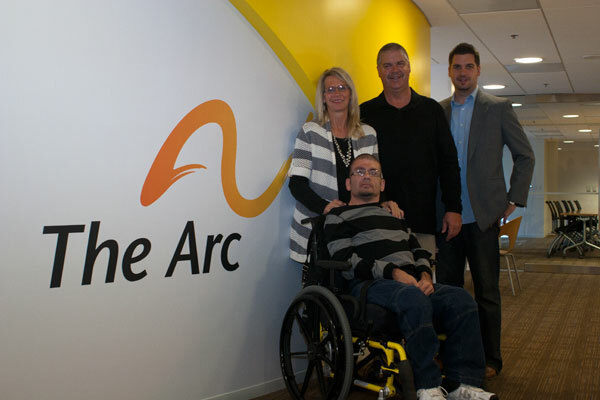 The Smothers Family: Tyler Smothers, Cindy Smothers, J.J. Smothers and Josh Smothers – visit The Arc's National Office. Tyler Smothers won The Arc's Achieve with us Contest, held last summer. Washington, DC – This week, The Arc of the United States welcomed Tyler Smothers, from Cedar Rapids, Iowa to Washington, DC to meet with Senator Tom Harkin, Senator Chuck Grassley, and Congressman Dave Loebsack (IA-2) to share his story of achievement. In August, The Arc announced that Tyler was the winner of the first ever “Achieve with us” social media contest. The contest invited individuals with intellectual and developmental disabilities (I/DD) to share their stories of achievement. Out of 119 contestants garnering more than 25,000 votes, Tyler was selected for his impressive achievements in his community, which had been devastated by floods in 2008. Tyler was and remains very involved with his local chapter, The Arc of East Central Iowa. As downtown Cedar Rapids succumbed to flood waters, and the chapter’s office sustained major damage, Tyler saw the need to help his community get back on its feet. So he became the driving force behind The Arc of East Central Iowa’s annual bike riding fundraiser “Tour de Flood.” Putting aside his wheelchair and using an adaptive bike, Tyler leads the ride, and every year since, has raised an impressive amount of funds for his chapter. As the winner of the contest, Tyler and his mother received a two day trip to Washington, DC. Tyler was in Washington, DC from November 1-3, meeting with The Arc’s National staff in addition to members of his Congressional delegation. Tyler was also joined by his father, J.J. Smothers, and his brother, Josh Smothers, who submitted Tyler’s entry on Facebook. During his meetings, Tyler shared the challenges of living with a disability. He also told Congressman Loebsack how the services he and his friends receive allow them to remain active in the community and how that is important to him. Tyler’s mother Cindy spoke about how Medicaid is a lifeline for her family. Without Medicaid, Cindy would not be able to work and Tyler would not be able to be the active member of his community that he is. Tyler’s meetings on Capitol Hill come at a critical juncture in budget negotiations, where programs that people with I/DD rely on could be on the table for cuts. The Arc is in the midst of an advocacy campaign, called “Don’t Cut Our Lifeline,” to protect Medicaid. “Anyone that meets Tyler will learn that he is a young man who values his independence and loves his community. Medicaid cuts in Washington would cause great harm to Tyler, his family, and millions like him across the country because they would be left without the services and supports that allow them to live the kind of life we all want for people with disabilities,” said Peter V. Berns, CEO of The Arc. Tyler made an impression on each elected official. Washington, DC – This week, The Arc of the United States will welcome Tyler Smothers, from Cedar Rapids, Iowa to Washington, DC to meet with members of the Iowa Congressional delegation. Tyler was very involved with his local chapter, The Arc of East Central Iowa, where he participated in day programs, social events, and interacted in his community. As downtown Cedar Rapids succumbed to flood waters, and the chapter’s office sustained major damage, Tyler saw the need to help his community get back on its feet. So he became the driving force behind The Arc of East Central Iowa’s annual bike riding fundraiser “Tour de Flood.” Putting aside his wheelchair and using an adaptive bike, Tyler leads the ride, and every year since, has raised an impressive amount of funds for his chapter. In fact, in the first year of the ride, Tyler set a goal of raising $2,000 – he far exceeded that amount, bringing in $18,000. The 4th annual “Tour de Flood” took place on September 18. “Tyler exemplifies what The Arc stands for and we are honored to host him and his family during their trip to Washington, DC. Tyler is an inspiration to his friends and neighbors in Iowa, and this week, he will take his message to leaders in Washington to demonstrate why in particular the Medicaid lifeline is so important,” said Peter V. Berns, CEO of The Arc. Washington, DC – In June, The Arc announced the first ever “Achieve with us” social media contest, inviting individuals with intellectual and developmental disabilities (I/DD) to share their stories of achievement. All entries were submitted through The Arc’s Facebook fan page, and today, The Arc is announcing the winner of this nationwide contest – Tyler Smothers from Cedar Rapids, Iowa. Out of 119 contestants garnering more than 25,000 votes, Tyler was the top vote getter in the contest and was selected for his impressive fundraising work for a local chapter of The Arc. Tyler is the driving force behind The Arc of East Central Iowa’s annual bike riding fundraiser “Tour de Flood.” Tyler helped create this event in 2008 to help raise money for flood relief. The goal was to raise $2,000, but by the end of the event, over $18,000 was donated. Using an adaptive bike, Tyler leads the ride, in spite of the challenges presented by Occipital Encephelocele, which causes Arnold Chiari Malformation type III. This fundraiser has become a celebrated annual event that continues to raise tens of thousands of dollars every year for The Arc of East Central Iowa’s enrichment programs for all ages, greatly due to Tyler’s passion and dedication. This year’s race will be on September 18th. Tyler and his mother will receive a trip for two for two days to Washington, DC, to share his story of achievement with The Arc’s National Office. He will also have an opportunity to meet with members of his Congressional delegation or their staff to discuss his work on behalf of the people of Cedar Rapids. “Tyler Smothers embodies The Arc’s belief that for all people with intellectual and developmental disabilities, achieving your goals and dreams is possible with drive, determination, and support from family and friends. This social media contest was successful beyond our expectations, and shows the power of people with intellectual and developmental disabilities in their communities,” said Peter V. Berns, CEO of The Arc. The Arc wrapped up its Achieve with us Contest August 15 with the selection of 10 finalists from 119 entries highlighting stories of achievement from people with intellectual and developmental disabilities. Over the past month, we have tallied more than 25,000 votes on Facebook and we’re ready to choose the grand prize winner from the top 10 vote-getters to win a trip to Washington, D.C. to share their story. In June and July, we encouraged anyone with an intellectual or developmental disability to share their story on our Facebook fan page at www.facebook.com/thearcus and compete for the grand prize through an online voting process. We’re pleased that the contest generated so many inspirational stories and received so many visitors to view those stories and vote! The Arc will arrange for the winner and a guest to visit The Arc’s national office and Capitol Hill for two days with a chance to share their story with their representatives in Congress and learn more about self-advocacy. The contest was sponsored by ABILITY Magazine, who will feature the grand prize winner in an upcoming issue of the magazine. We invite you to check out our 10 finalist’s stories and look for an announcement of the Grand Prize winner in early September. Thank you to everyone who participated in making this contest a success! The Arc recently kicked off our Achieve with us contest inviting people with intellectual and developmental disabilities to share their inspirational stories of achievement for a chance to win a trip to Washington, D.C. Now, we’ve sweetened the pot by partnering with ABILITY Magazine, the leading source for information on health, disability and human potential. This award-winning publication has provided new insights into individual levels of ability for nearly 20 years and they want to feature the winning entry in The Arc’s Achieve with us contest in an upcoming issue. So if you or someone you know has a winning story to share, visit www.facebook.com/thearcus and enter today for your chance to win a 2-day, expenses paid trip to the nation’s capital and be featured in the pages of ABILITY Magazine. Plus, they’re kicking in a free one-year subscription to the magazine for the winner along with 25 complimentary copies of an issue to share with friends and family. Enter NOW until July 14 then encourage everyone you know to vote for your story between July 15 and August 15 to win! Who knows, your smiling face could end up in the pages of ABILITY Magazine! WASHINGTON, D.C. (June 14, 2011) – Fifty years ago, President Kennedy called on the nation to bring people living with intellectual and developmental disabilities (I/DD) “out of the shadows,” to give them opportunities to lead productive, quality lives. Sadly, new data released today from The Arc’s Families and Individual Needs for Disability Support (FINDS) survey shows efforts have plateaued and not nearly enough progress has been made to create these opportunities. While budget cuts and economic strain have hurt all Americans, the 7 million living with I/DD and their families are among the hardest hit, with access to needed services drastically reduced. In fact, 62 percent of caregivers reported a decrease in services for their family member with a disability. Meanwhile, budget proposals in Congress threaten to dismantle Medicaid, making it even harder for people with I/DD and their families to achieve. According to the FINDS survey, one-third of parents and caregivers (potentially 1 million families) reported that they are on waiting lists for government funded services, with the average wait more than five years. The survey also found that the promise of integrated, community-based employment is not being met. In fact, 85 percent of families reported that their adult family members with I/DD are not employed at all. Opportunities for inclusive education, a pre-requisite for employment, are also not being met. Too few students are completing high school – in fact, 52 percent of families reported that their family member with I/DD left school without receiving a high school diploma. FINDS found more than 75 percent of families report problems accessing non-institutional community care, trained reliable homecare providers, services and resources. Families are shouldering tremendous financial strain as they’ve had to assume the financial and day-to-day support of their loved ones; many have even had to quit their jobs to stay home and provide care. 1 out of 5 families (20 percent) report that someone in the family had to quit a job to stay at home and support the needs of a family member. More than 80 percent of families reported not having enough retirement savings for their future as a result of using personal funds to compensate for the lack of services available to their loved ones. 62 percent of parents and caregivers don’t have a plan for where the person they support will live when the parent/caregiver gets older. As a result of the report, The Arc is calling for more activism by people with I/DD and their families, launching a new effort to organize 1 million people to come out of the shadows and make their needs and concerns an issue in the 2012 elections. To raise awareness surrounding the barriers those with I/DD face and how the organization can help individuals and families fully participate in society, The Arc has partnered with Lauren Potter, star of the hit FOX show “Glee.” As a successful actress with Down syndrome who is achieving her dreams, Lauren represents the spirit of The Arc’s work. Today, The Arc and Potter will kick off a public service announcement television campaign. “I became involved with The Arc when I got the Image and Inclusion award last year. I am happy to be able to help portray a positive image of people with intellectual and developmental disabilities. I’m glad the Arc works to protect human rights of children and adults with intellectual and developmental disabilities,” says Potter. To encourage people with I/DD to share their stories of achievement, The Arc is conducting a national contest via their Facebook fan page. Starting today until July 14, entrants can share a story and a photo highlighting the accomplishments of an individual with I/DD for the chance to receive a trip for two to Washington, D.C. For more information about the “Achieve with Us” contest, please visit www.facebook.com/thearcus. For more information, or to see additional survey results, please visit thearc.org. The web-based FINDS survey was conducted from July 22, 2010, through October 31, 2010. The survey was completed by 4,962 caregivers of people with disabilities. Families from all 50 states and Washington, DC completed the survey. Achieve with us and Win a Trip to Washington, D.C. The Arc works on a daily basis to empower people with intellectual and developmental disabilities to achieve full and satisfying lives. But its individuals like you who actually do all of the achieving! So, to put the spotlight on you and celebrate your achievements, we launched a contest to identify the amazing achievements of people with I/DD across the county. Enter The Arc’s Achieve with us contest between now and July 14 for a chance to win a trip to Washington D.C. to visit your representatives in Congress and The Arc’s national office on a 2-day, expenses paid trip simply for sharing your story of achievement with The Arc. So if you, or someone you know who has an intellectual or developmental disability has a story to share, enter now. Then be sure to encourage everyone you know to vote for your story between July 15 and August 15 for your chance to win! Here’s how to Achieve with us! Write a short (500 words or less) narrative/essay telling us your story of achievement and submit it along with a photo at www.facebook.com/thearcus between June 14-July 14. (Photo not required by encouraged). Entries can come from individuals with I/DD who are 18 or older, their parents, guardians, caregivers or friends or from the parents or guardians of children under 18 who have I/DD. Spread the word and encourage everyone you know to view your entry and “vote” for you between July 15-August 15. If you win, you’ll hear from us after August 15 to make arrangements for you and a guest or caregiver to come to Washington, D.C. before December 20 and share your story with The Arc and elected officials on Capitol Hill. Check out complete contest details at www.facebook.com/thearcus. Send in your story and tell us about your achievements on Facebook today. Then be sure to get out the vote starting July 15 and you could win!